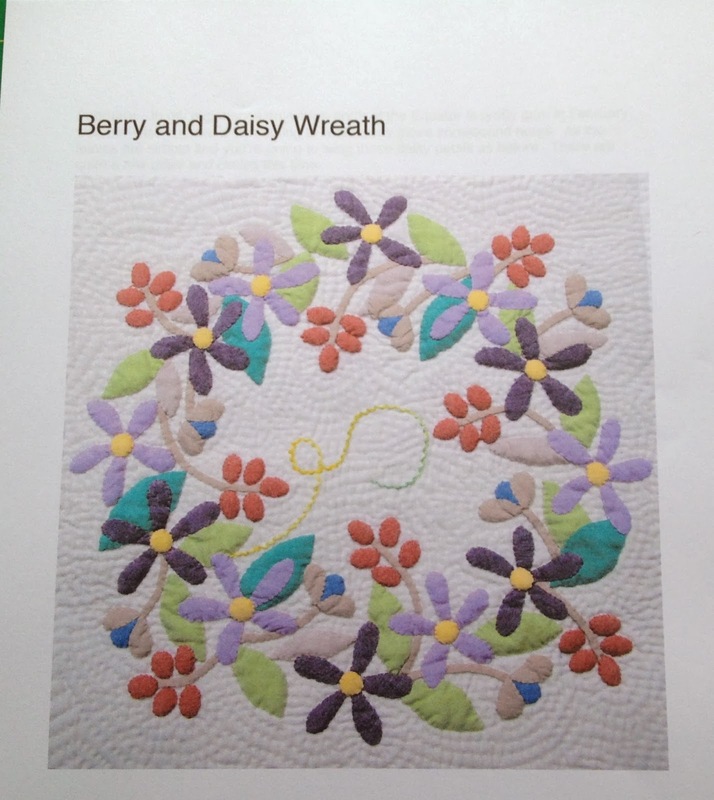 I thought I would get a post in before the 1st of February, when the two BOM's I am doing will land on my sewing table and the OMG's begin again, or more politely what have I let myself in for..
Well the lovely Deborah Kemball has done it to me already and it's a case of OBH. This is February's 12" block. You must agree it was a case of just a little swear word, sorry Deborah, but this is the hardest one yet.. If I make it through this one I shall have conquered my fear of hand appliqué . 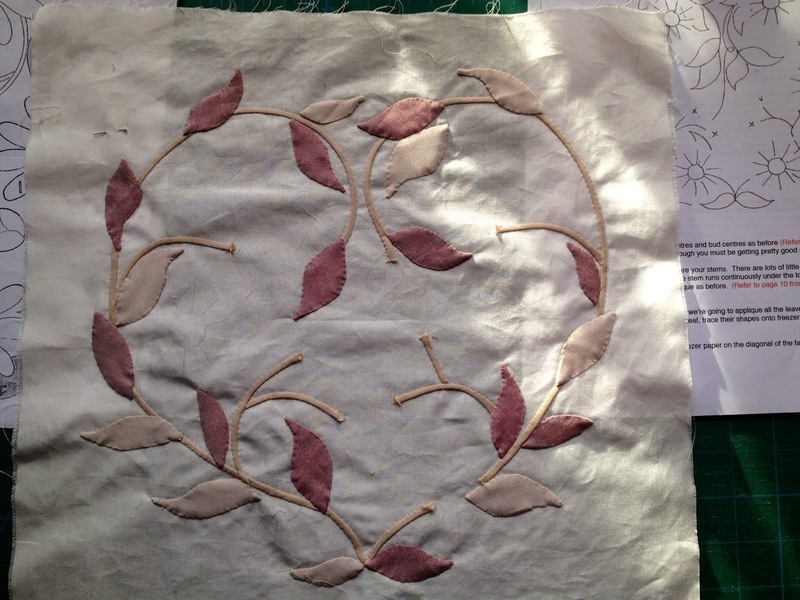 The fabric for this BOM is from Oakshott fabric, We are using the Impressions range. I have been very busy as it's all those Birthdays again in February. 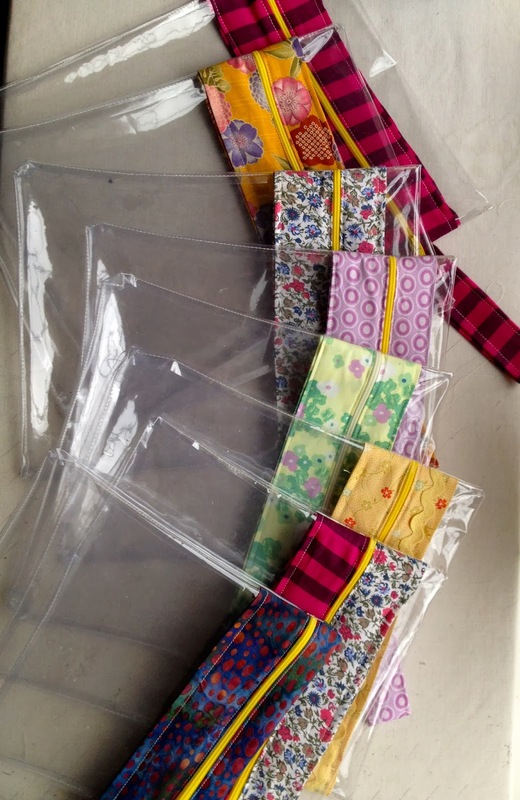 Six of the "girls" in our Bee group are all born in February, so I have been making little see-through zip pouches. You will be pleased to hear its all from my stash. I did wonder when that roll of vinyl would come in handy. 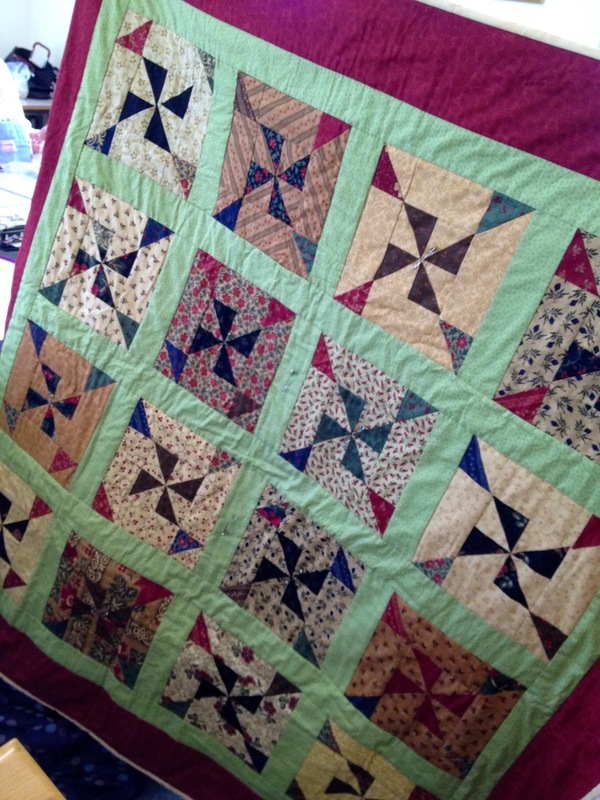 I finished hand quilting the top half of the Mystery quilt and added the binding and hanging lugs. 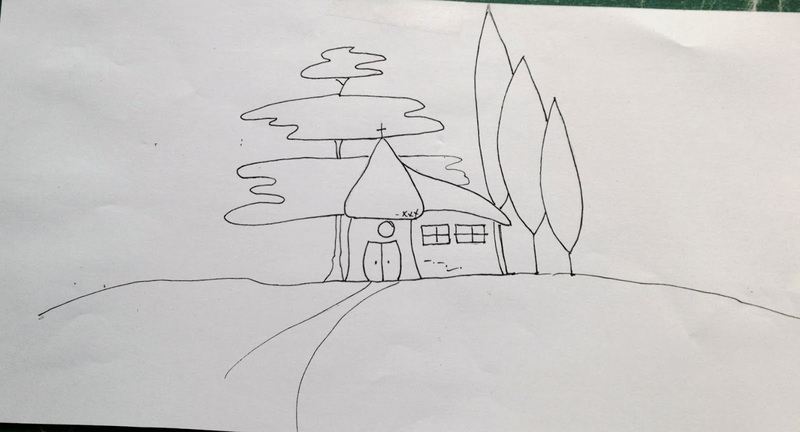 St Felix School, and local ladies that do craft work. 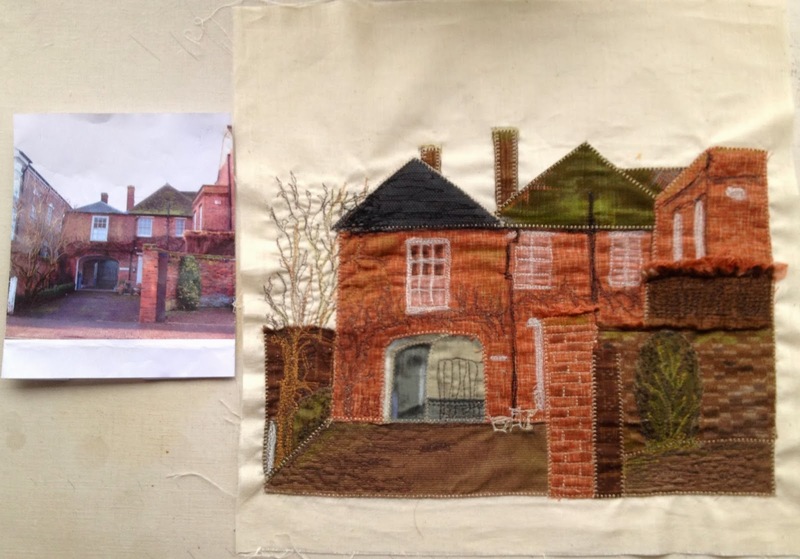 It will become one huge quilt, all about Southwold and surrounding area. The next Block is the Fish and Chip Shop, watch this space.. I do indeed want to let you into a little secret. When I started the Mystery BOM off I used my trusty Bernina. Half way through, about block six I think, I bought my self a new machine (a Janome) and the rest of the blocks were done on my new machine. On the 9th block I could not make out WHY my oblong blocks did not fit as in block 5. It was altogether smaller, yes indeed a lot smaller, so that is why I am having to make my wall hanging into two separate little wall hangings. 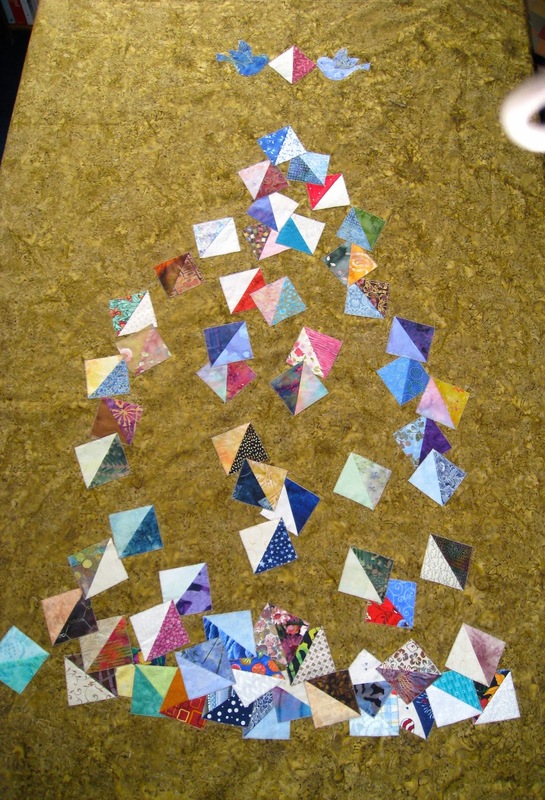 This is it all together as one long Wall hanging. 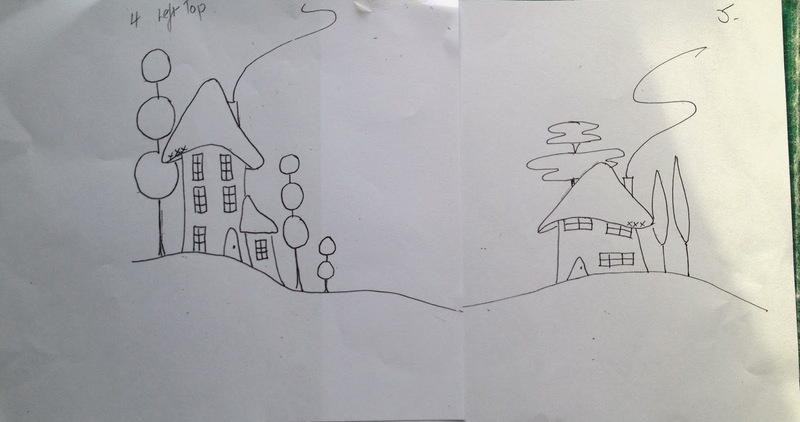 As our ceilings are very low in our little cottage, two smaller hangings are better for us. 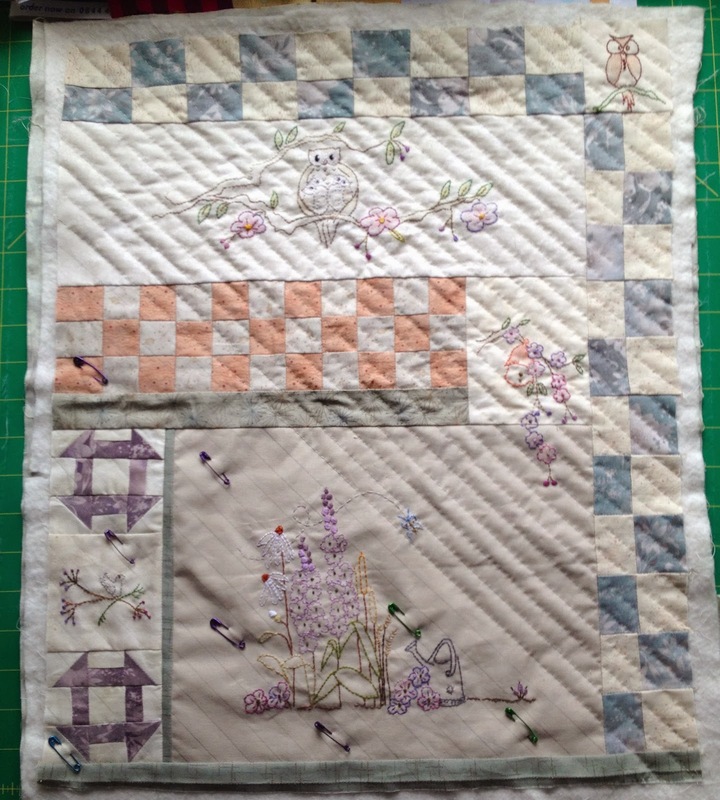 Now it is time to start the quilting. I have chosen to hand quilt mine. I started yesterday, it was such a grotty day(weatherwise) but just the kind of day to sit in front of the fire and hand quilt. 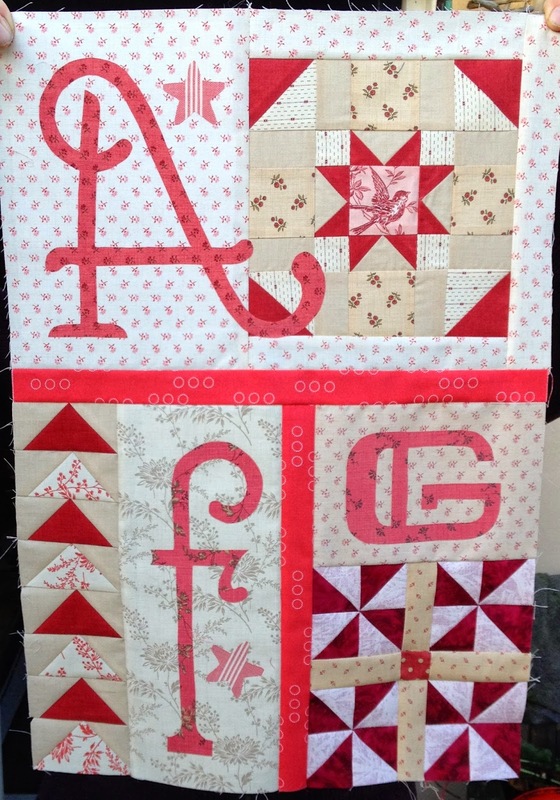 The Elfin Way Quilt is now finished, though it does still need a label. 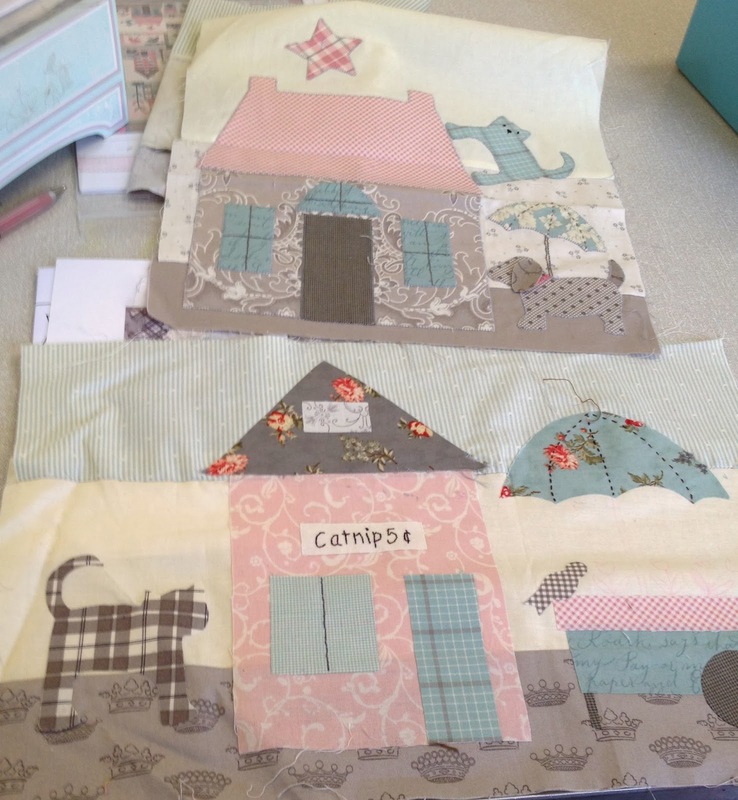 So here are the next two stitchery blocks as promised. 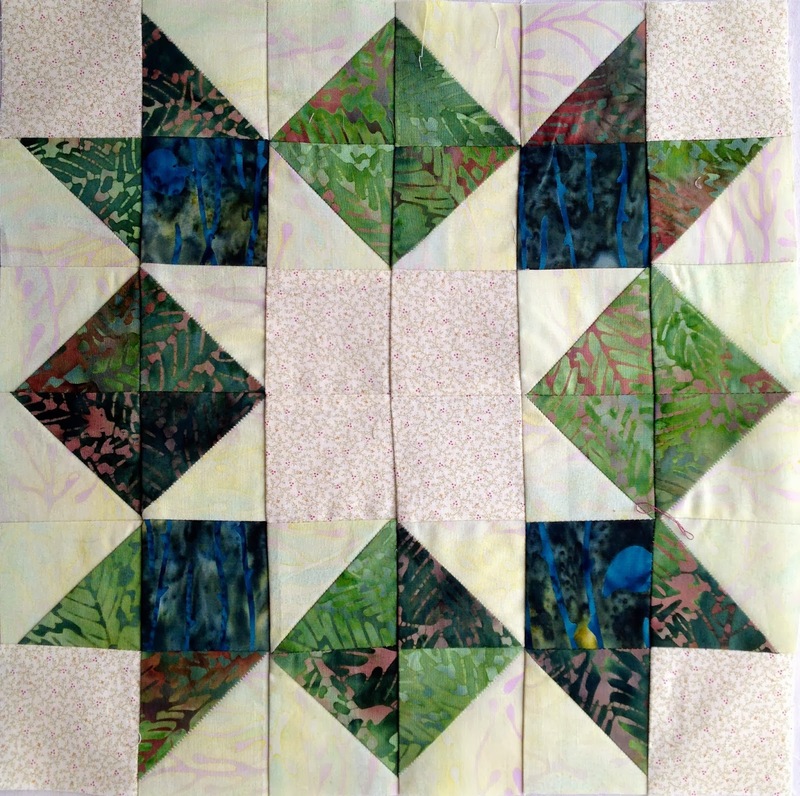 and last but not least the finished quilt, with strange sun light shining through. The red work quilt "Elfin Way" has been quilted, just straight line cross hatching, and yes after much deliberation it was done on the machine. Now just the binding to do, and as you know that is the part I like the best, when the bindings are done and apart from the label it's finished. 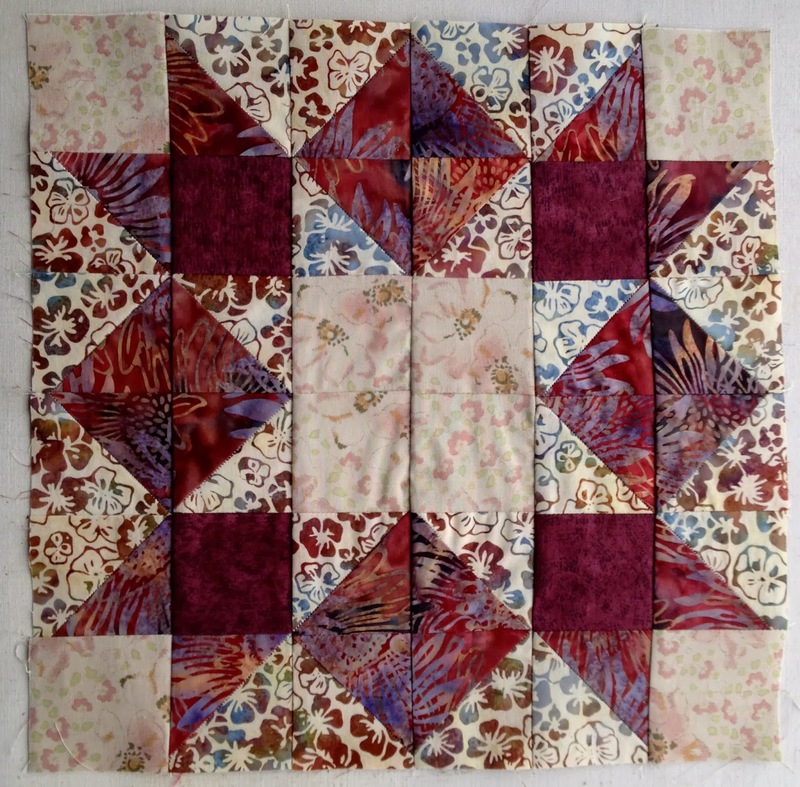 This was a very easy quilt to make, just 96 X 4" inch squares of different red print fabrics, made into 4 patch blocks, 7 1/2" finished size. 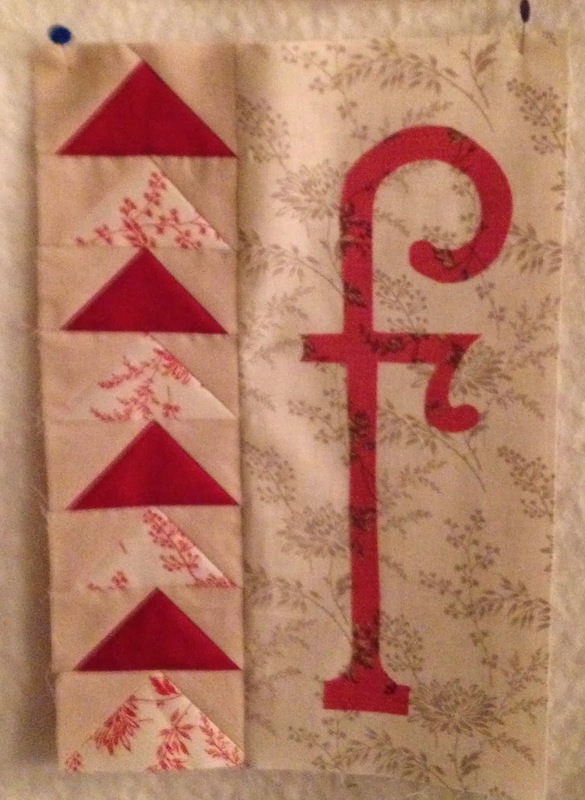 The small neutral blocks for the Red work were 7 1/2" square, and the larger ones 14" x 7 1/2". Here are the first two red work pattern blocks if you wish to make it. 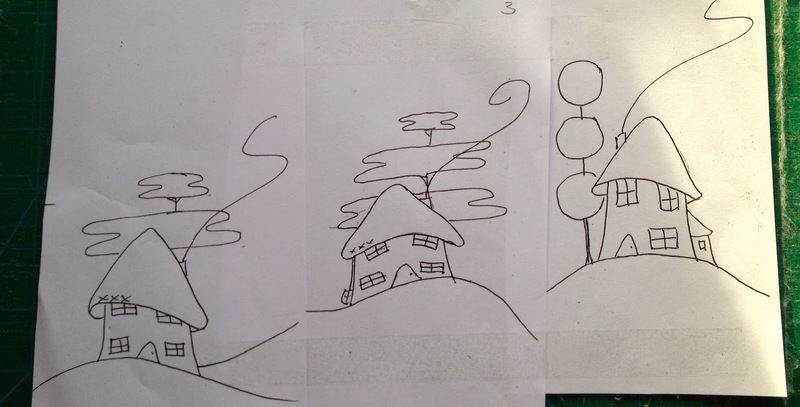 The Elfin Church, middle of the top row. First block of second row. 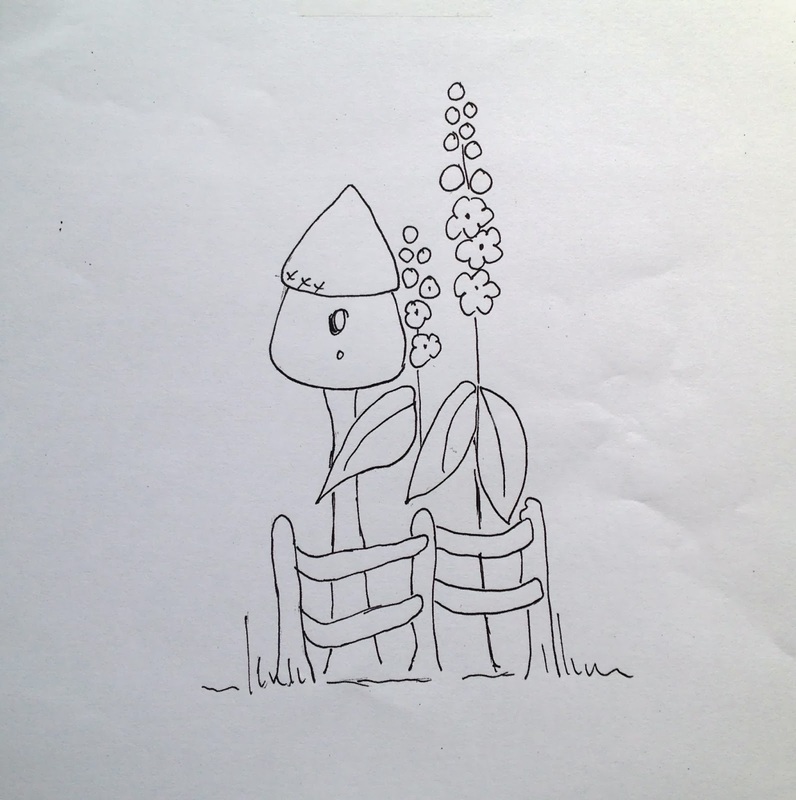 I am happy for you to download these designs for your personal use. (add them to your downloads before you print them). I would love to see what you make with them. A friend asked me why I don't sell these patterns. 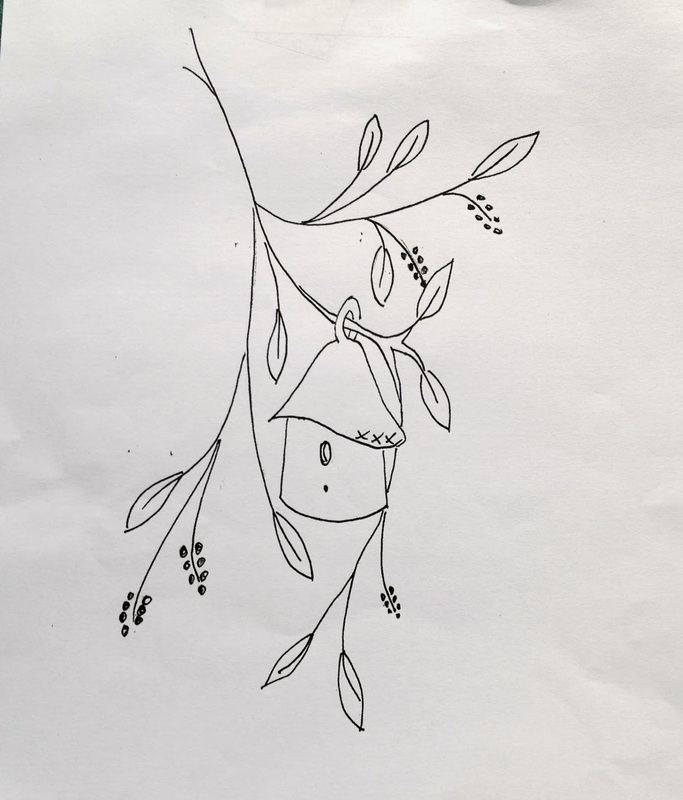 Well I have hundreds still in my head and many, many more in sketch books and at 70 I will probably not have enough time to get them all down on paper and made into quilts. 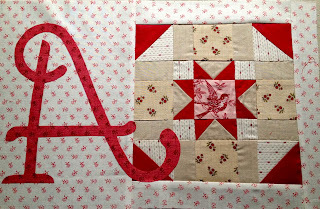 There are 8 red work blocks in all in this quilt so I will put up two new ones each time I post my blog. The Siblings together blocks are beginning to come in, as I am the Mama this month to our group of 12. It is lovely receiving blocks made by someone else. It's like receiving a present. 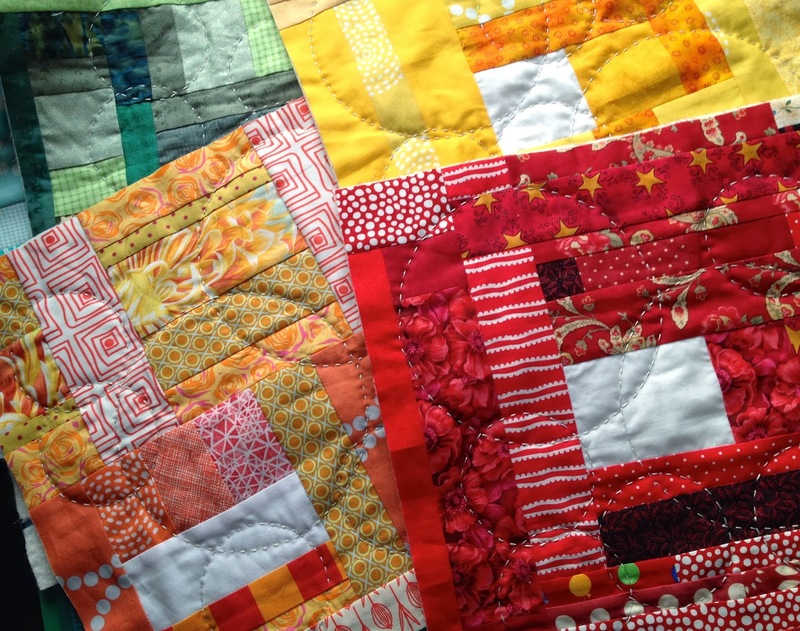 The blocks so far are lovely and bright and are going to make a very happy quilt. 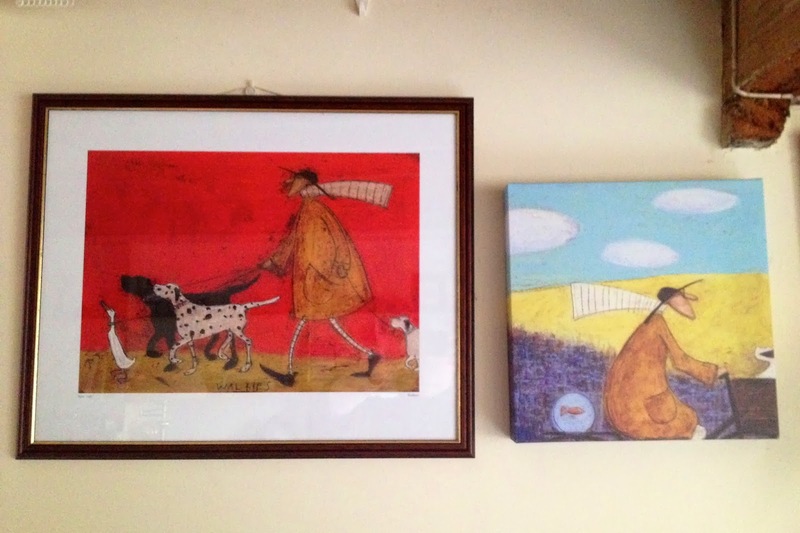 They are by Sam Toft, and we have many more hung around out little cottage.. I do hope Sam Toft makes you smile as well.. It's Epiphany, or as some say Twelfth Night and all the Christmas decorations are due to come down. I love it when we put them up but it is oh! so good when they come down. For me, I have all that space back in my sewing room..though I have been busy busy since I got my mojo back. I finished the red/beige quilt top (all from my stash}, but was appalled at all the red/ beige fabric I still had left, including half a jelly roll. I do not think of red, though be it sludge red, as being much in my colour spectrum, I thought I was more a taupe, blue, green person. Just goes to show you. Here is the finished Elfin Way top. Wadding/ batting I have but I just might have to piece a backing together to finish it off. Now do I put all that fabric back again in the drawers, or make another quilt. 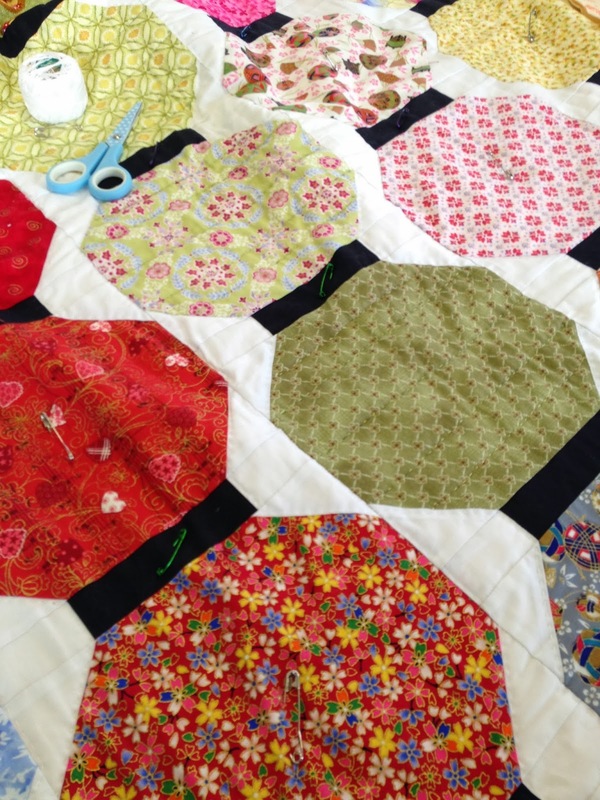 Well, the answer is make another quilt. I was very pleased with the colour combo, but fancied something different. 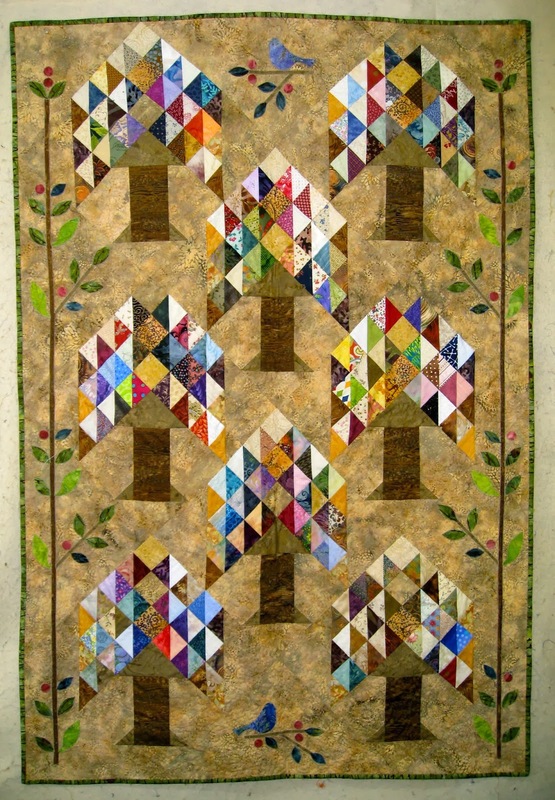 I am a member of The Quilt Show and every year they do a BOM and it is free to members. 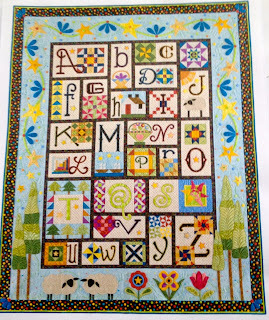 I have done several and this year it is an Alphabet Quilt. 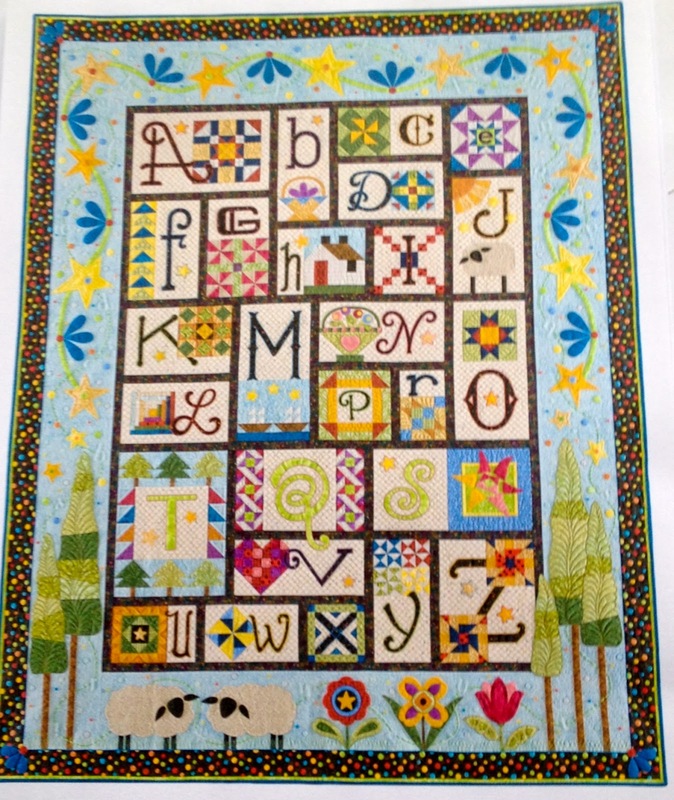 Now it so happens I have always wanted to do an alphabet quilt and this one appealed to me as it's quite quirky. Now what was it going to look like in my stash fabrics. the Red/ Beige. Januarys block is A, F & G and I have had a little go at A & F and I do think it is going to work. Sorry about the F block photo. It was taken in the evening and I have the stitching still to do around the lettering. 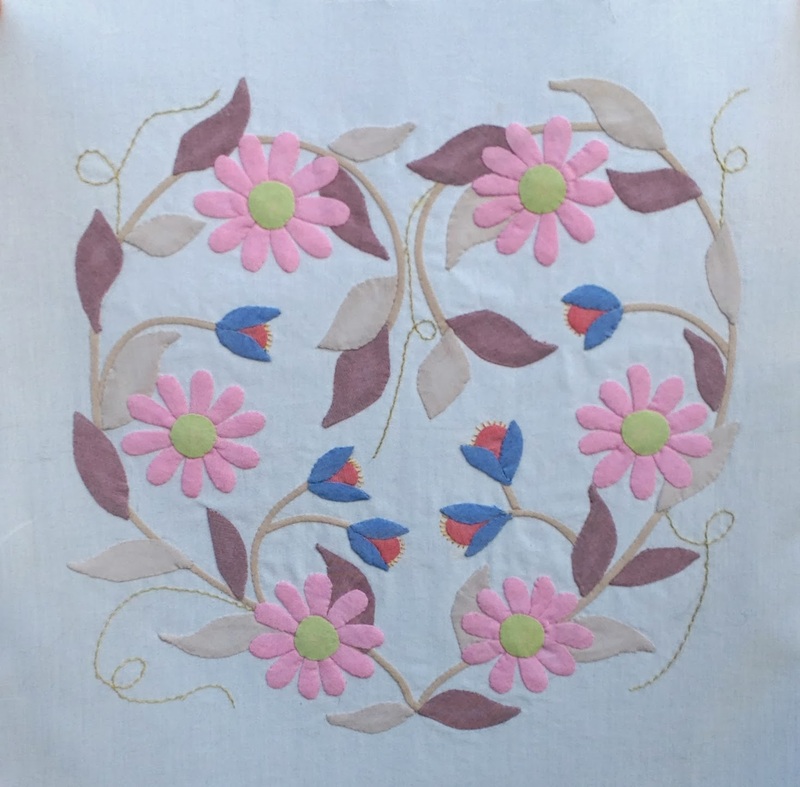 Having a lot of hand sewing on the go at the moment, I reckon this might be done on the machine. All the stems and leaves are done. 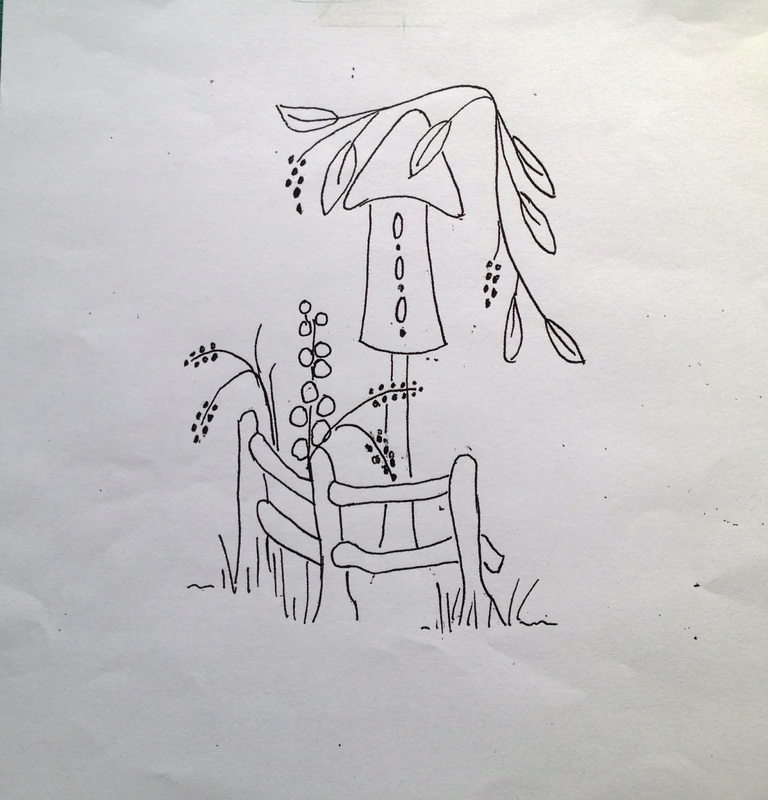 Now for the asters (60 petals in all,) and they are weeny. Thats my job for this evening, to start them. 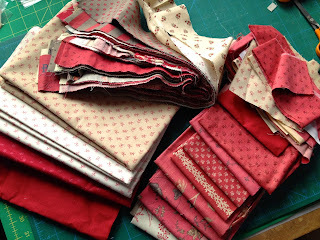 As you know I am on a fabric fast, using fabric from my stash and I am starting quilt No 3. Well, I am on a yarn fast too and have started the first pair of socks for 2014 from my yarn stash. 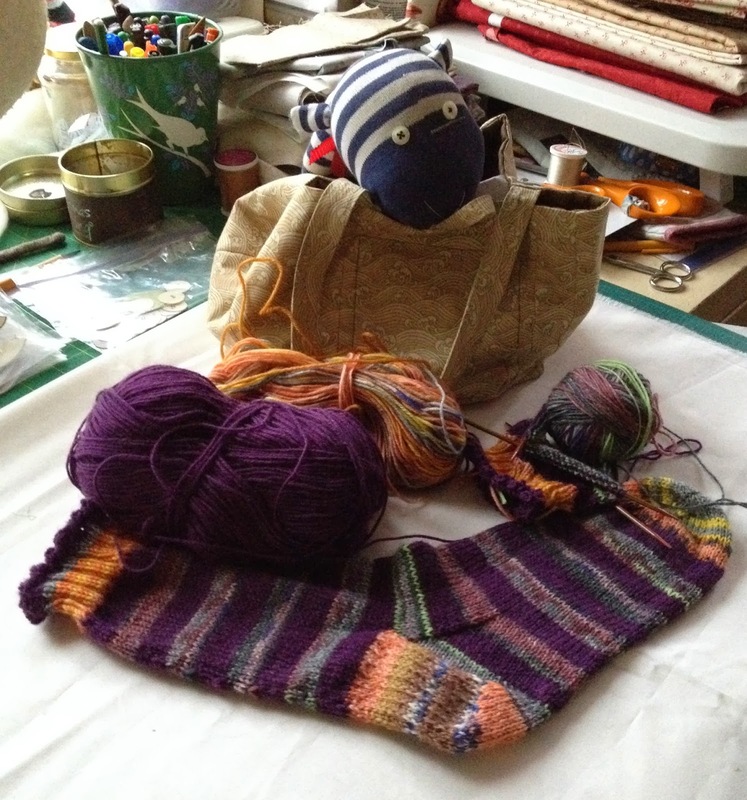 This pair is from 3 scrap balls, my sock buddy looks most amused. The Quilt Show is worth looking at as there are quilting videos twice a month by well known quilt artists, and the hosts Alex Anderson and Ricky Timms are great fun..